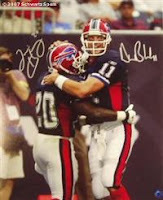 AAA Sports Memorabilia Blog: QB Drew Bledsoe to Retire! QB Drew Bledsoe to Retire! Quarterback Drew Bledsoe has announced his retirement! Yesterday, came a shocking announcement that Drew Bledsoe was retiring after a long 15 year career. Bledsoe has made it to the Super Bowl twice during that span. Bledsoe was the top overal draft in 1993 being picked up by the New England Patriots. Bledsoe made it to the pro-bowl four times and played for the Patriots, Buffalo Bills, and Dallas Cowboys. He had been a starter for all three teams, but ended up as a backup with Dallas. Bledsoe is still young at 35. His stats include 44,611 yards and 251 touchdown passes. Bledsoe stated, "I feel so fortunate, so honored to have played this game I love for so long, with so many great players, and in front of so many wonderful fans. I fulfilled a childhood dream the first time I stepped on an NFL field, and the league did not let me down one time. I retire with a smile on my face, in good health and ready to spend autumns at my kids' games instead of my own. I'm excited to start the next chapter of my life."